A disabled man was turned away from a flight at Belfast International Airport because staff were worried that his wheelchair repair kit was a security risk and could be used to “dismantle the plane”. 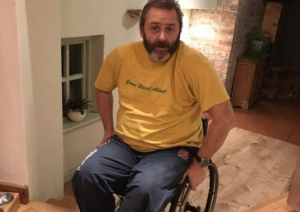 Steve Smithers, 48, who is paralysed from the waist down, was turned away at the security check-in and subsequently missed his flight. Smithers was on his way to see his elderly father who is about to undergo treatment for cancer. He was travelling alone to London Gatwick Airport from his home in Killinchy, County Down with the kit, which also contained diabetic medication and a catheter. 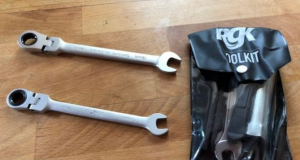 The bag, which contains a number of small spanners and nuts, is essential to wheelchair users. Without these tools, they are unable to fix broken equipment – leaving them stranded. “I have travelled extensively over the eleven years I have been paralysed and there have never been any problems preventing me from doing so independently,” Smithers told the BBC. After an inspection, the airport’s security gate supervisor instructed Mr Smithers to put the kit in the hold. However, the security supervisor added that he would not have time to make it back through security if he did so. Smithers suggested that he hand the kit to the cabin crew until they landed, but this was also rejected. He explained that he needed the tool kit in order to adjust his chair to fit the car he had hired for his arrival in London. He called the hire company to confirm that there were no mechanics available to make these adjustments for him on site. Smithers said he ended up having no choice but to miss the flight. “For disabled people it is not about asking for special treatment, but simply wanting the opportunity to live life as unimpaired by our disabilities as is possible, and to be allowed to do so with dignity,” said Smithers. Belfast International Airport has since apologised to Smithers, saying the treatment he experienced fell “well below standards” expected of its security personnel. The airport added that it would be reviewing its customer service procedures “immediately”. Both EasyJet and the car hire company have refunded him in full. Belfast Airport also offered to provide Smithers with compensation, but he requested that the money go to a disability charity instead. How Does the Accessibility and Equality Act Support Wheelchair Users? The Equality Act makes it unlawful for organisations and businesses, whether they are public or privately owned, to treat disabled people less favourably while providing a service. It is also illegal for business owners not to have made reasonable adjustments to make their premises as accessible as possible. It’s important to remember that the discrimination doesn’t have to be intentional to be unlawful. In this instance, Smithers could use the Equality Act to argue that this was an example of discrimination against disabled people, based on the way he was treated by airport security – and being forced to miss his flight as a result. The airport’s reasoning for not allowing the kit on board (even if it were in the care of the cabin crew) would be difficult to defend, as the probability of anyone being able to dismantle a plane with their bare hands is very low indeed. However, there are some safety rules as to what individuals can – and can’t – bring on a flight. Specialist medical equipment can be taken in the cabin, so long as it is accompanied by the relevant supporting documents. Whether a tool kit for a wheelchair would come under this provision remains unclear. However, based on the evidence above, we’re not surprised Belfast International Airport was quick to apologise and offer compensation. Is Sir Cliff Richard’s Court Victory A Game Changer For The Media? Is the industry being a sore loser, or should we all be concerned by the ramifications of yesterday’s ruling? Britain Won't Block The Death Penalty For 'Isis Beatles Duo'. Here's Why It Matters. Human rights campaigns have labelled the decision a 'huge step backwards' and a massive shift in UK policy.